Upgraded 10” wheels, 150 cc , 4 gears manual transmission, Real Italian Vespa , not Bajaj , not Replication. 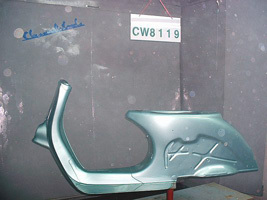 We do restoration from ground up and each scooter is like new after coming of our facility. New parts: The following parts are guaranteed to be replaced in each scooter. Bearings ( all engine and shaft bearings ), seals, cylinder, Piston, rings, whole “carburetor” , condenser, contact breaker assembly, fuel tap assembly, tap lever , Gear selector box and cover, spark, Kick start pedal, clutch plates and drum, connection rod, air filter, brake pads, ignition coil and assembly, exhaust system, air intake hose, rear suspension ( shock), front damper, gear selector cruciform, tires, tubes, odometer ( in kilometer), Tires, tubes, seats, leg shield trim, floor strips, seat carrier, original rebuilt head and new tail light assemblies, all electrical wires, all rubber parts , all cables, central chrome stand, emblems, logo, front end stainless cover aluminum clutch and front brake levers, left side compartment lock, light switches assembly, all brackets and almost 98% of bolts and nuts are replaced with new ones and much more.